Subtle shape and colour to give your garden a little designer style. This beautiful pastel-coloured planter comes finished with a white-washed foliage design around the outside of the pot, adding a splash of subtle colour to patio displays. 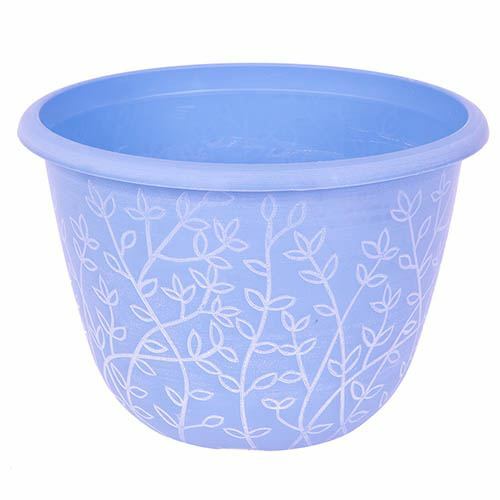 Looking just as stunning as ceramic or metal plant pots, but half the price, these plastic pots are easy to transport around the garden and are durable too, made from heavy-duty injection moulded plastic. They’re frost & UV resistant too, so they'll withstand the worst of our British weather and can be used year after year. Perfect for bulbs, bedding, shrubs, houseplants and more, each planter has raised drainage holes and water reservoirs to allow your plants to thrive. Made from a durable UV stable plastic, and hand painted with a brushed blue and white finish.